On Tuesday, February 27—conveniently timed to coincide with “Fair Use Week”—the Second Circuit Court handed down an opinion in a closely watched and long-awaited case regarding the fair use of copyrighted works. While the case, Fox News Network v. TVEyes, Inc., concerned the copying and distribution of television and radio programming, it is significant for the rest of the copyright community as it clarifies the so-called “transformative use” test of fair use analysis. Was Fox News’ content “transformed”? Fox News, as we all know, is a national cable news station that transmits content 24 hours a day. TVEyes is a search engine for broadcast media, allegedly only for the use of professional and corporate clients. TVEyes’ business model is to record all programming from approximately 1,400 radio and television stations and make that programming searchable for its clients via a text-based search system (by using closed-captioning transcripts). The search engine then displays a list of clips containing the search term, and the client is able to watch any of the clips in question. While the clips themselves are limited to 10 minutes each, there is no limit to the number of clips clients can watch, nor to how many times any one clip can be watched. (It should be noted that the quality of the clips is substantially similar to that of the original television or radio broadcast.) Interestingly, TVEyes had tried to license Fox News’ content, but when it couldn’t reach an acceptable deal, TVEyes decided instead to use the content without a licence and without paying any fee. Meanwhile, TVEyes charges its clients a license fee of $500 per month for the content. 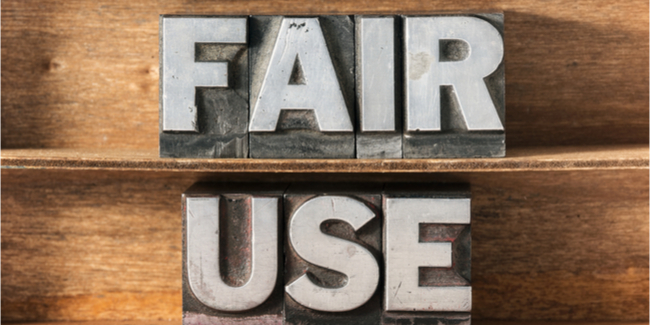 What’s fair about “fair use”? From most perspectives, this situation looks pretty unfair for a content creator, as Fox News was here. The lower court didn’t think so, however, and held that most of what TVEyes was doing was fair use under the Copyright Act (although the court did find that giving clients the ability to download and send clips by email was not fair use). More specifically, the lower court found that TVEyes’ indexing and excerpting of news programming was a “transformative use” and that it was necessary for TVEyes to copy all of Fox News’ programming to accomplish this purpose. The court also found that there was no resulting market harm to Fox News. This meant that although the lower court limited TVEyes’ operation in part (by limiting its ability to allow its clients share clips online and by email), TVEyes was nonetheless able to operate much as before. Under the Copyright Act, courts must consider four factors to determine when a use of copyrighted material is a “fair use”: (i) the purpose and character of the use (which usually involves considering the transformative nature of the new work and whether or not the infringing use is of “a commercial nature”); (ii) the nature of the copyrighted work (for example, facts are not protected under copyright law and the copying or sharing of breaking news clips may be more broadly accepted); (iii) the amount of the original work that is borrowed; and (iv) the potential effect the use would have on the market for the original work. These factors are not considered in isolation but are weighed together. Disagreeing with the lower court, the Second Circuit found that while TVEyes’ use of Fox News’ content was “slightly” transformative, it was not a fair use—contrary to recent case law that has seemed to conflate the two issues. Although the service offered by TVEyes provided a benefit to its clients, it also made practically all of Fox News’ content available to TVEyes subscribers and interfered with Fox News’ market for the content. This is in contrast to the finding in Authors Guild v. Google, where the court deemed Google’s digitization of thousands of books into a text-searchable database to be a fair use. In that case, however, Google only showed its users the three lines around the search term and imposed various limits to make sure its service was not used to read whole books, whereas TVEyes provided subscribers access to all of the content copied to create the database with very few limitations or safeguards to prevent abuse. Further, the fact that TVEyes’ clients included multiple government agencies, congressional offices, journalists, and companies showed that there was a need for this kind of service. By providing this service without a license from Fox News, TVEyes was depriving Fox News of a potentially important and profitable licensing opportunity. Is it a win for creators? Contrary to common misconception, creators are in favor of fair use. It allows our culture to flourish and develop by making sure that creators can build upon that which came before. However, if the fair use doctrine is taken too far, it threatens these principles and the very livelihood of creators, who depend on the ability to use their works as they please, license the rights to develop and use them to others, and create derivative works. This is what happened in Authors Guild v. Google case, and the lower court’s decision in TVEyes was an archetypal example of exactly the kind of overreach feared after that decision. Thankfully, the Second Circuit saw the light here and agreed that similar so-called “transformative” uses (i.e., mere applications of new technology that add no new creativity) can indeed be harmful to markets for creative works and it also clarified the boundaries of the Google decision. This decision marks an important step toward resetting the balance to ensure copyright law does what it is supposed to do—protect the artist’s ability to benefit from their work so creators will keep on creating.